Seven candidates will stand in Fifa's presidential election on 26 February. The candidates are: Prince Ali bin al-Hussein, Musa Bility, Jerome Champagne, Gianni Infantino, Michel Platini, Sheikh Salman bin Ebrahim al-Khalifa and Tokyo Sexwale. Trinidadian ex-footballer David Nakhid was not included on the list, despite saying he had submitted his candidacy. The Swiss 79-year-old announced he would be stepping down in June, with world football's governing body at the centre of a corruption scandal. "David Nakhid's candidacy has been invalidated due to the fact he only received four valid football association nominations. Candidates require five. "It is understood one national association nominated both Nakhid and another candidate. Under the election rules that would invalidate the nomination. "Nakhid's camp are believed to be writing to Fifa to demand an explanation as to how and why he has been barred from running." Platini, the head of European football's governing body, is also suspended, but Fifa's electoral committee says it may allow him to stand if his ban ends before the election date. Fifa and Swiss prosecutors are investigating reports that a £1.35m payment was made in 2011 for work Platini did as Blatter's adviser. 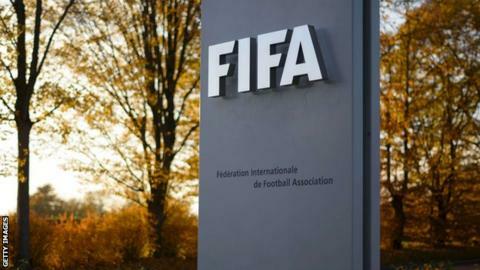 All candidates had to obtain the written backing of five football associations under Fifa electoral rules. Can Mandela's ex-prison mate lead Fifa? Read more on Tokyo Sexwale: Can Mandela's ex-prison mate lead Fifa?